Our products use almost 100 percent local inputs in an effort to minimize carbon footprints. We also choose only best ingredients. Our kombucha product line uses loose tea leaves (no bleached tea bags, please), unbleached premium natural cane sugar, mineral water, and all-natural flavorings. Our kefir product line is brewed with best culture grains obtained from a very reputable sources. Both our kefir and kombucha are gluten-free, raw, unpasteurized, low in sugar and calorie, and brewed to be alcohol-free. Our dressing is made with the highest quality olive oil, with no preservatives, no sugar, no gluten, no animal products, non-dairy and full with the goodness of live probiotics so you can eat (and drink) your probiotics instead. Our carefully sterilized glass bottle vessels are 100% recyclable, reusable, and we refund those, too, for the love of mother earth and its inhabitants. Kunyit Asem is a widely-known jamu, an Indonesian healing tradition concoction made from barks, roots, and spices. Kunyit Asem is traditionally used to cure PMS in women, fatigue, and digestion problems. It is very rich in curcumin, which is believed to be a cure-all, and in fiber and vitamin C from tamarind. Fresh tasting and invigorating. Our drink blends the power of Kunyit Asem jamu with mighty live probiotics from kombucha (fermented tea), multiplying the benefits by combining prebiotic nature from jamu with live probiotics from kombucha. Self-respecting men can also now join the women in enjoying the benefits. Drink your probiotics instead. Calorie 53, Sugar 7 grams per 175 ml before second fermentation, by which process reduces calorie and sugar content further and create fizz. Packaged in 100 percent recyclable, reusable, refundable glass bottle. 370 ml. This is our modern take on Wedang Jahe, a widely-known Indonesian beverage, made from healing ginger, traditionally used to cure common cold, fatigue, and digestion problems. Rooted in Ayurvedic medicine, this is exactly what our ancestors reach for to cure ailments. Our drink blends the power of Wedang Jahe with mighty live probiotics from kombucha (fermented tea), multiplying the benefits by combining prebiotic nature from ginger with live probiotic benefits from kombucha. Lower sugar and calorie than traditional Wedang Jahe. 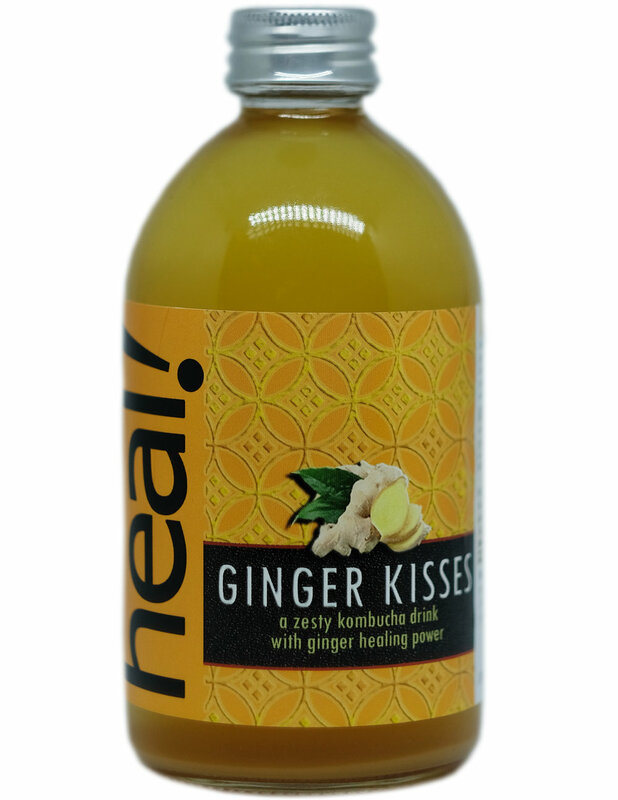 A bit carbonated from natural fermentation process, this is a much better alternative from your average ginger ale with the bonuses of live probiotics. Calorie 50, Sugar 7 grams per 175 ml before second fermentation, by which process reduces calorie and sugar content further and create fizz. Packaged in 100% recyclable, reusable, refundable glass bottle. 370 ml. Since ancient time, charcoal has been viewed as an antidote. Now we know that it has myriads of benefits, among others as natural treatment for lowering cholesterol, detoxifying body, treating cases of poisoning or drug overdose. In culinary world, no wonder that charcoal is now all the rage. This drink blends highest-grade activated charcoal with mighty live probiotics from kombucha (fermented tea). Since charcoal adds almost no taste, this drink tastes pure and simple, with a tang and effervescent qualities that are quite refreshing. Calorie 40, Sugar 3 grams per 175 ml before second fermentation, by which process reduces calorie and sugar content further and create fizz. Packaged in 100% recyclable, reusable, refundable glass bottle, 370 ml. Mojito is a very popular cocktail on hot sweltering days. Originated in Mexico, it is made by mashing mint leaves, sugar, and lime juice with a stick muddler for couples of minutes, then topping it off with white rum. Yes, that yummy rum. But ours are more sinful and mindful, using our own local limes, without rum and adding kombucha instead! There is enough vitamins and antioxidants in this bottle to sustain your day. It is also easy on the palate, making it a good starter kombucha for those who want to start a kombucha regimen. We can sit by the pool, pond, river, beach, or even our cozy room with this virgin Mojito on hand. Now pass that sombrero and sun glasses, please. Calorie 45, Sugar 6.5 grams per 175 ml before second fermentation, by which process reduces calorie and sugar content further and create fizz. Beras Kencur is one of the most widely-known jamu, an Indonesian healing tradition concoction made from barks, roots, and spices. Beras Kencur is traditionally used to cure common cold, fatigue, and digestion problems. Rooted in ayurvedic medicine, this is exactly what our ancestors reach for to cure ailments. Our drink blends the power of Beras Kencur jamu with mighty live probiotics from kombucha (fermented tea), multiplying the benefits by combining prebiotic nature from jamu with live probiotic benefits from kombucha. Lower sugar and calorie than traditional Beras Kencur, why take probiotic pills when you can have a delicious enjoyable drink? Calorie 45, Sugar 5 grams per 175 ml before second fermentation, by which process reduces calorie and sugar content further and create fizz. This is our modern take on Bir Pletok, a social beverage from Olde Batavia, made from healing spices, roots and barks, used to fight common cold, fatigue, and digestion problems. The tradition of putting lots of spices in our beverages dated back to ancient time. After all, Indonesia in colonial era was known worldwide as the Spice Islands whose highly-prized spices have launched thousand ships from all corners of the globe. Our drink blends Bir Pletok with mighty live probiotics from kombucha (fermented tea), multiplying live probiotic benefits from kombucha with Bir Pletok prebiotic benefits. Fermentation produces a lower sugar and calorie drink than traditional Bir Pletok, and create a carbonation, making it a healthy alternative to commercial soda. Calorie 45, Sugar 5,5 grams per 175 ml before second fermentation, by which process reduces calorie and sugar content further and create fizz. Strawberries make their claim in history as a luxury item enjoyed only by royalty. They are rich in vitamins C and K, fiber, folic-acid, manganese, and potassium. They also contain significant amounts of phytonutrients and flavonoids which makes strawberries bright red. 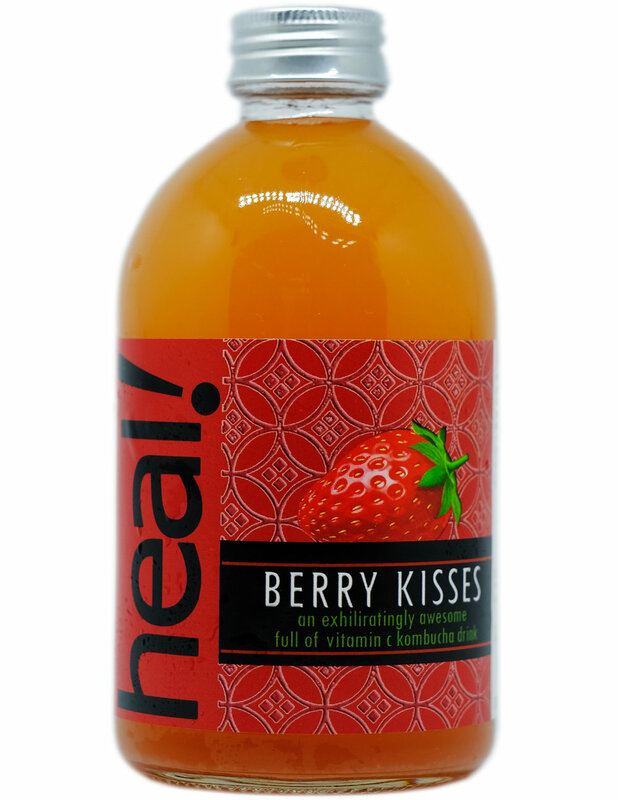 This drink mixes local all-natural strawberries with mighty live probiotics from kombucha (fermented tea). There is enough vitamins and antioxidants in this bottle to sustain your day. It is also easy on the palate, making it a good starter kombucha for those who want to start a kombucha regimen. Calorie 45, Sugar 6.6 grams per 175 ml before second fermentation, by which process reduces calorie and sugar content further and create fizz. Pure Bliss is a pure kombucha with no flavor additions. It highlights the quality of our Javanese oolong tea in our kombucha brew. Our loose oolong tea is one of the finest tea leaves we possibly can find. Our oolong is sweet, fruity with honey aroma. Oolong tea (烏龍茶 wūlóng chá or black dragon tea), usually rakes higher price as the manufacture of oolong tea involves repeating stages to achieve the desired amount of bruising and browning of leaves. Withering, rolling, shaping, and firing are similar to black tea, but much more attention to timing and temperature is necessary. In Fujian, China, they use this tea as ceremony tea. Why do we use the best tea possible (read: expensive)? Because the quality of final kombucha depends on the choice of tea. After all, kombucha production takes only four inputs: water, tea, sugar, and time. Pure Bliss is easy on the palate, making it a good starter kombucha for those who want to start a kombucha regimen. A century ago, E. Metchnikoff, a pioneer immunologist and nobel prize winner, noticed the longevity of poverty-stricken people in Caucasus mountains and attributed the fact to wide consumption of soured milk full of active probiotics. In 2017 we decided to craft this delicious active probiotic drink to help reduce excesses of modern life. 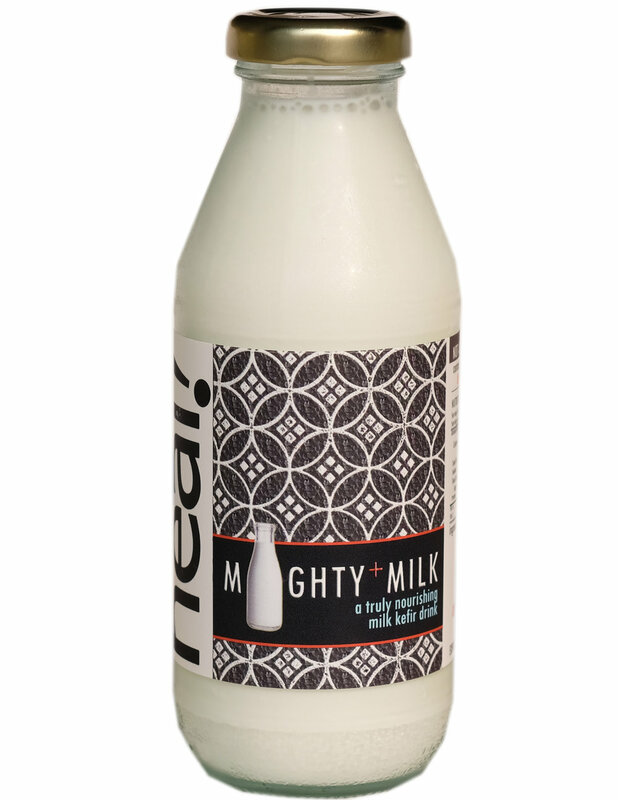 Our Milk kefir is creamy and so healthy. Rich in antioxidants, enzymes, calcium, manganese, folate, biotin, vitamin B12 dan K2, it aids digestion, boosts immunity, strengthens bones, helps cure skin problems, and delays aging. It contains at least 10 live probiotic strains. Because cultures and fermentation process turn milk lactose into lactic acid, many consider milk kefir safe for lactose-intolerant people. A delicious blend of water kefir and cold-pressed Pineapple juice and local basil leaves. Water kefir contains varieties of probiotic strains that are really effective in balancing gut flora. Fragrant, isotonic, refreshing, bubbly, and hydrating, it contains 12.5% fresh juice. You will soon forget how healthy it actually is for you. Replace your store-bought soda with our water kefir for your health and enjoyment. Calorie 35, Sugar 4 grams per 175 ml before second fermentation, by which process reduces calorie and sugar content further and create fizz. Packaged in reusable, refundable glass bottle, 370 ml. Green Goddess owes its name and gorgeous color to amazing spirulina and chlorophyll. It is an isotonic probiotic blend of water kefir and kombucha, giving you more varieties of probiotic strains for a healthier you. Spirulina adds omega 6, omega 3, protein, vitamin B1, B2, B3, copper, iron, magnesium, potassium, manganese and almost every other nutrient we need. Chlorophyll, on the other hand, stimulates immune system, detoxifies blood, and energizes body. Green Goddess is a perfect recovery drink from ailments and exertions. Calorie 20, Sugar 3 grams per 175 ml before second fermentation, by which process reduces calorie and sugar content further and create fizz. Fab Red owes its most gorgeous color to the healthy hibiscus tea. It is an isotonic probiotic blend of water kefir and kombucha, giving you more varieties of probiotic strains for a healthier you. The benefits of hibiscus include relief from high blood pressure, high cholesterol, digestive, immune system, and inflammatory problems. It protects liver and helps manage bodyweight. Hibiscus is rich in vitamin C, minerals and various antioxidants. In Indonesia we consume tukmeria seeds for the taste, fiber contents, ability to cool down body fast, constipation relief, blood sugar regulation, and weight management. A really delicious dressing that is sugar-free, vegan, dairy-free, preservatives-free, gluten-free and good for us who follow an anti-inflammatory diet regiment. It tastes so much better than supermarket dressings. 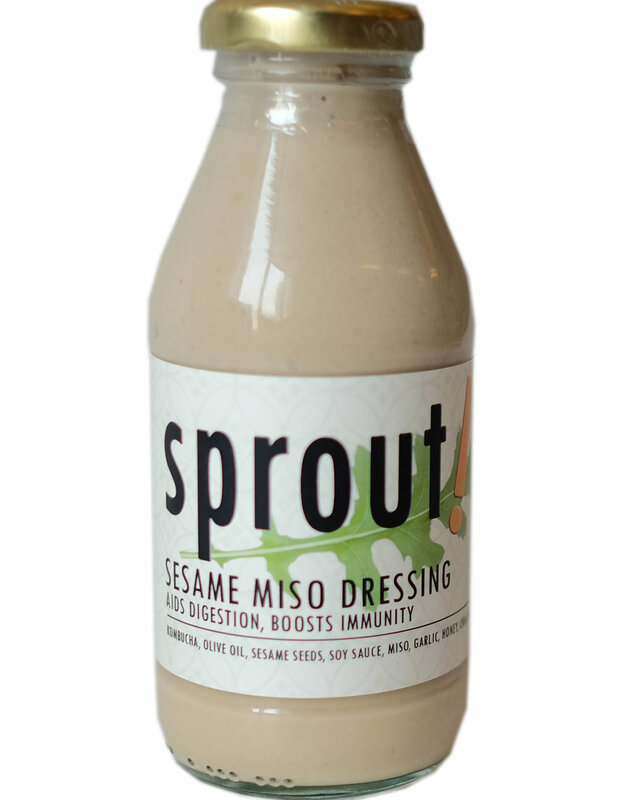 It contains live-probiotics, antioxidants, enzymes, calcium, thyamine, magnesium, copper, manganese, iron, and vitamin B.
Pour it on salad greens, noddles, or spread it on bread, or dip your veggie sticks on this yummy thick dressing. Packaged in reusable, refundable, glass bottle. 280 ml. Who doesn’t know the health benefits of raw, probiotics-ladden vinegar? Alas, high quality apple cider vinegars are costly, both in price and environmental impacts they incur, as they are imported from faraway land. This Raw-Honey Vinegar was crafted by utilizing the best raw local forest honey we can get our hands on. Unlike apple cider, this vinegar contains bee pollen and propolis carried over from the honey, and glucuronic acid for liver detox. Brewed for months and months, it still has a pleasant sweetness to it. Use it in salad, in recipes, vinegar drinks and many more.